Our solid polyurethane wheels are 100% washable, meeting FDA requirements for use in food processing environments. One piece molded design eliminates bonding failures. Solid poly wheels are non marking, and high impact and abrasion resistant. Solid polyurethane wheels can be used within a temperature range of -50° to 180° F. Tread hardness is 60 Shore "D" Durometer. Choose the standard wheel bearings or select from the following list for optimum polyurethane wheel performance. 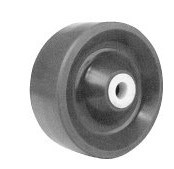 Call 1-888-9045-9531 for more information and to order solid polyurethane wheels. NCC-SPUS414 4 1-1/4 1-9/16 1/2 400 3/8 "
NCC-SPUR620 6 2 2-3/16 1-3/16 1200 5/8 and 3/4 "
NCC-SPUR820 8 2 2-3/16 1-3/16 1400 5/8 and 3/4 "